Yet these Keystone Cops still fail to catch guns and box cutters – even when using the body-scan equipment! 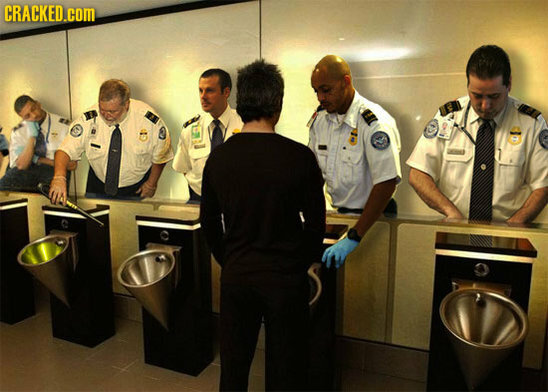 So let’s make fun of these bureaucrats by looking at some of my favorites images mocking the TSA from Cracked.com. There are 17 of them, and I’ve only picked four, so feel free to peruse the rest. And here are three other pics that rank high on my list. Click to enlarge. The only thing that worries me about these clever parodies is that some TSA bureaucrat may see them and decide they’re a good idea. By the way, if you like music and TSA humor, enjoy this, this, this, and this. TSA is just a jobs program for the unemployable. There have been 70 reported security breaches in the last 14 months. After sixty billion dollars they can’t cite one success, fail 70% of security tests and allow 60% of the freight in the hold go unchecked. Pistole has failed to contain the rampant misconduct and mismanagement within the agency and it needs to be replaced with something that works. On my way home to Michigan from Rome. TSA people were courteous and efficient. They are doing a good job of protecting travelers, and I believe they have been better trained then were the earlier versions. Maybe it’s time to cut thema a little slack. There are idiots in any profession so dumb things will continue to happen. 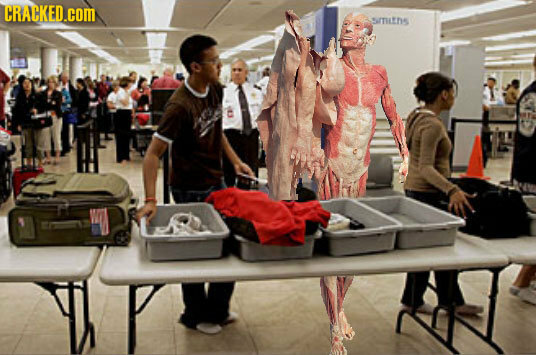 The TSA is a jobs program. If there were not a world-wide hostile, hidden terrorist threat, it would be necessary to invent one.